As soon as Clay got off the school bus Friday afternoon, ran up the driveway and into the house, I sensed his energy level was high. So, even though it was 50 degrees outside and windy, a walk in the woods at a nearby nature center seemed like just the ticket to get us through until dinner. Clay has been to this nature center before and hurried ahead of me on the trail to a bench next to a pond. He sat down. I sat next to him. 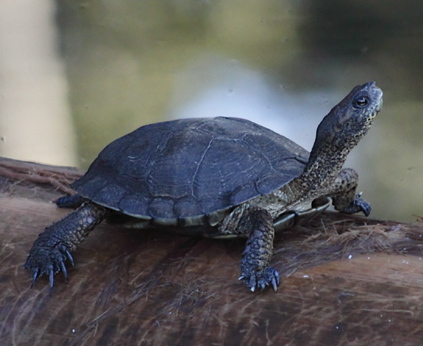 About 100 feet away, nine turtles were perched in a neat row on a log. One turtle at the far end was twice the size of the others, so I’m guessing it was a mother and her eight babies. Clay and I sat for five or six minutes. We watched the water rippling on the pond. We listened to a woodpecker drilling into a tree deeper in the woods. When Clay has a lot of energy or is particularly excited, he sometimes gets what we call the “screechies.” He lets out high-pitched honks every few minutes. We can tell when he is watching a favorite video from the other end of the house by the machine-gun bursts of excited screeches. He had the screechies Friday afternoon. After we sat for a few minutes, he suddenly let out a squawk followed by the phrase “truffula trees.” (Dr. Seuss’ The Lorax). Hearing that squawk shatter the quiet of their pond, those baby turtles must have thought a jumbo jet-size hawk was about to swoop from the sky and take them away. A hawk so big it would blot out the sun on its descent and eat them like so many pistachio nuts. They slid into the water one after the other in a perfectly timed ballet. In about 15 seconds, only the mother was left. No telling what she was thinking. I decided it was time for us to head home. Just another day in the woods. Photo credit: Alan Vernon. Attribution. This entry was posted on March 28, 2010, 4:00 pm and is filed under Daily Life. You can follow any responses to this entry through RSS 2.0. You can leave a response, or trackback from your own site.